After being gifted with a bag of Arborio rice (thanks Khursten! 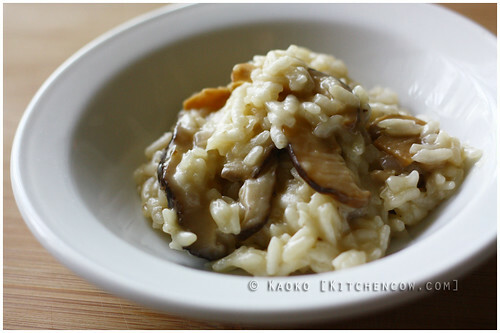 ), my newest cooking mission was to learn how to make risotto. While I love this wonderfully saucy, gloopy, velvety Italian rice dish, I never tried making it before because it sounded daunting. It felt like I had to have tons of cooking experience and a couple of years worth of cooking techniques to master the dish. Still, I didn’t want the gift to go to waste, so I did my research, cracked my knuckles, and set about cooking risotto. This recipe isn’t it. (Got you there!) My first attempt was a sundried tomato and pesto risotto, which while lovely, still needed work. But the nice thing about it was it made me realize how uncomplicated risotto really is. Sure, it’s quite a bit of work continuously stirring a pan—Though I plan to try Martha Stewart’s leave unattended version soon—but while it was tedious, it wasn’t too complicated. And it gave me enough courage to try conjuring up my own recipe, picking through various ideas and applying techniques I learned from that first attempt. Start with a two-burner stove. On burner one, bring your chicken stock to a simmer. Keep it simmering the whole time. In a second pan, melt your butter over medium heat. Add the mushrooms and saute. When done, transfer to a separate dish for use later. Still in the second pan (it’s all right if you drained the butter out with the mushrooms), add your olive oil. Saute your chopped onion until it softens and becomes translucent. Be sure not to burn. Add your arborio rice. Do not wash it beforehand. Stir it well (this is called toasting), letting the rice grains get coated with oil and turns opaque. This takes 2 minutes or so. Add your white wine and stir frequently until all the liquid gets absorbed. This is where the fun part begins. Once the wine has been absorbed, pour some of your simmering stock, a ladleful so that’s 1/2 – 2/3s cup, into your rice. The resulting mix should bubble lightly. Just a little, really. Stir continuously until the stock gets absorbed. It’s important not to cook over too high a flame (low to medium will do) because too much heat dries up the liquid before it gets fully absorbed. You’re just looking for a little bubble. When your first ladleful gets absorbed, add another ladleful of stock. Stir continuously. Think of cold, chilly things while stirring. The act of stirring is important because it works the starch out of the rice, creating that creamy texture. Yes, only when I started to research about cooking risotto did I realize that the creaminess came from the rice grains itself and not from any added cream. Astounding. At this point, I added my cooked mushrooms, figuring the flavors will get absorbed better this way. Some people like adding it later though, as they finish the risotto already. It’s easier to stir when you add the mushrooms later, but the mushrooms cook better when added earlier. Your choice. Continue the process. Add stock. Stir. Let it be completely absorbed before adding the next ladleful. Do not get overly excited and add the next ladleful too soon. If you do, the rice grains won’t be able to fully absorb the liquid and it could resort to gloopy risotto. Like my first batch. It takes time. A lot of recipes say that it takes 15-20 minutes, but it was closer to 30-40 minutes for me. All I did was stir. Add stock, stir some more, until the texture became ideal. The rice needs to be al dente. Cooked through, but it still has a little bit of a bite to it. Not a raw bite, but a firm bite. If yours isn’t done by the time your stock is finished, add a bit of hot water instead. Or more stock if you still have it. The amount of stock you need is really an estimate. You may use it all up, you may use less, or you may need more. The rice will tell you what to do. One forum I visited said that cooked risotto should flow like lava. That’s a good description. Finish your risotto off with parmesan cheese. Season with salt and pepper. If you’d like to add other cheeses—I’ve tried to add feta and it was glorious—feel free to do so. The technique is exacting, but the recipe isn’t. Don’t be afraid to experiment and try new combinations. Serve while hot, on warmed plates even. Leftovers? Refrigerate, then reheat the next day, reconstituting it with more water or stock. Or make Arancini aka Fried Risotto Balls. Which I did to my leftovers and will be posting soon. Soonish. Trust me though, it will be worth the wait. You know what this prepares you for? HAINANESE CHICKEN RICE.